Hey there code wranglers! I think it's about time I gave you fine folk another update on how Code Smart is coming along. I've been working hard over the last months to get Code Smart in a shape that's fit for release. My previous titles have released in simple form, and have built into grand epics over time. 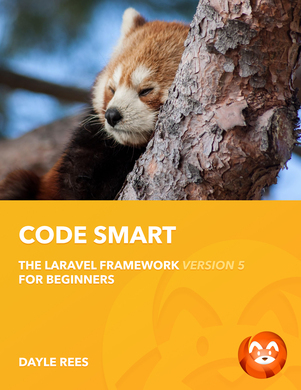 However, Code Smart will start with all of the Code Bright content updated for the latest version of Laravel. This means that on launch, Code Smart will have around 400 pages, and that will only be the beginning. From there we'll continue to explore additional features, and techniques for the framework. I'm committed to delivering at least one additional chapter per week. As I've mentioned in previous updates. I'll be reusing the content of Code Bright as a base for Code Smart. This doesn't mean that the content will be copied and pasted. Sure, the same chapters on basic components that you know and love will be there, but this time they've had a few upgrades. Let's take a look at what has changed. All of the content has been updated for the latest version of Laravel. Extra functionality has been added, deprecated functionality has been removed. File paths and locations have been updated to match the new application layout. You'll be a cutting edge Laravel pro in no time at all! The examples in Code Bright were a little messy. Every example in Code Smart has been updated in terms of formatting and content. Every example segment will feature full syntax highlighting, a title, and an example number (to easily make notes or report errata). All code examples have been upgraded to be compatible with the PSR-2 PHP code standard. We're also using new features that have been added to PHP since Code Bright. Goodbye legacy array syntax! All code examples within the book have an associated unit test. This means that if the version of Laravel updates, and something isn't valid any more, then I'll know right away. I'll update the book as soon as possible. The stories have been removed. Given feedback, I've decided that removing the stories will allow you to quickly get to the content that you need. Don't worry, terrible cheesy humour has not been removed. All content has had a bit of a refresh, and should be of higher quality. It will still be familiar, but should read better than it previously did. The whole introductory chapters of the title have been replaced. This means that I've now simplified the process of getting started with Laravel. For example, we'll learn how to get started with homestead, which means that you can be up and running with the framework in a few minutes, and you won't need any system administration knowledge at all. I've also added some new chapters on basic framework concepts, request lifecycle, and general hints and tips on application design. As you know, my titles don't have a set completion. I'm constantly adding new content to them. This time around, you'll be driving that content. I'll be announcing votes (likely on twitter) for which new piece of content should be written next, and reacting to the features and services of Laravel that you want to learn about. We won't stop until this is a Laravel masterpiece that is worthy of the 'Code' line of succession. So when the fudge can I get it? Well, it's clear that there has been a bunch of demand for the title, and I'm truly flattered and grateful for all your interest in the book. As you know, I just won't release something to meet a deadline. I'll release a book when I feel that it's ready. The good news is that Code Smart is almost ready. I'm adding the finishing touches for a first release, and I'm happy to announce that it will be available later this month. While I've not set an exact price yet. I'm also pleased to announce that the new title will be cheaper to purchase than Code Bright was. This is my way of thanking you all for supporting my self-published works over the years. Without your support, and your investment in Code Happy, Code Bright and PHP Pandas, I simply wouldn't have been able to release another book. The evolution from hacker to self-published author has been one hell of an adventure, and I'm excited to see what comes next. It's time that I get back to working on the book so we can get it in your hands sooner. Please be sure to follow me on twitter as I do most of my announcements there, and you'll be the first to hear when the book is available for purchase.